YCP-head by Jagan Prajasankalpapadayatra created hype.Jagan's padayatra will enter Krishna district, where the ruling TDP is gaining ground.This was done with the aim of bringing the hype to a good pilgrimage immediately after arriving in Krishna district. TDP leader Yalamanchili Ravi has already announced that he is joining the YCP.In the presence Bridge of Kankadurga In the presence of Ravi Jagan, the party scarf will cover.For this, large number of YCP leaders are set up.The idea was to start a trip to Krishna district with the help of TDP.The idea was to start a trip to Krishna district with the help of TDP. The YCP leaders are making arrangements.Jagan padhayatra reached 136th day. Jagan has completed the padayatra in Kadapa, Kurnool, Anantapur, Chittor, Nellore, Prakasam and Guntur districts so far. 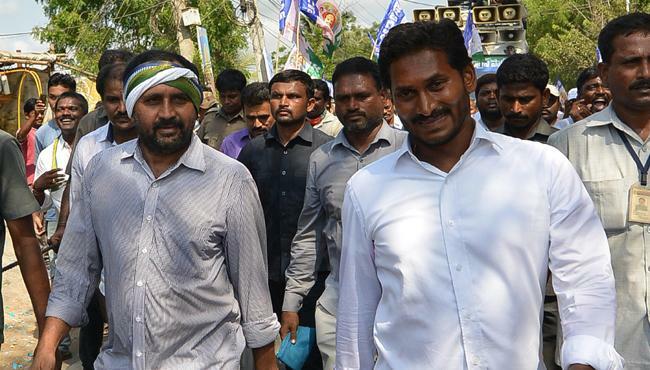 Jagan's padayatra is complete in all seven districts.Only six districts remain. The party leaders are making arrangements to reach Jagan's padayatra Krishna district. TDP was upper hand Krishna district. This time the YCP's attempt to sack the TDP from the very first district. That's why Jagan plans to walk on foot. YSRCP leaders are ready to take on the opening day of the yatra. On the Election Day of 2004 and 2014, TDP chief did not care for him. The party decided to join the VicerSpype, assuming he had no future. Jagan has said he is ready to take any responsibilities. He said that people do not trust Chandrababu to change words on special status. Some ministers commented that he was trying to harm him. TDP has left me in all respects. That is why it was announced in the YCP.